4278 Persea americana - Avocado Lila, 3 gal pot, Grafted ? Lila. Very cold hardy variety. 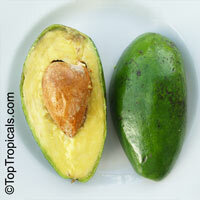 Produces medium size, green fruit. Season: September-October. Don't confuse this variety with Lula, which is popular in Florida and used for rootstock (that one is cold hardy to only 25F). It survived temperatures around 10F near San Antonio, Texas (Zone 8b). Can take temperatures down to 15F for short period of time without significant damage. See about successful growing in cold climate.